Thread: Ardeche Gorge canoe hire? Hi, can anyone recomend a place to hire a Canadian canoe in the Ardeche (Valon area)? I know there are loads of places but i dont want to paddle it in a sit on top or a mouled plastic tub. I am out here until end of May so I will see what I can do for you on this front. I am running a UKCC Coach 1 at present but will see what I can find in the next week. It will have no bouyancy if its a canoe: I have seen Old Town Discoverys for hire somewhere. I am not back in the Uk until mid June as we are off to Slovenia when I finish here. However.....it has rained all day here. Cold very wet and very British! But it will turn hot soon enough and the river has plenty of water in it. If you are canoeing seriously and paddling multiple rivers you may want to take your own canoe, however for a fun day or two's paddle down the Ardeche the normal hire boats are actually great - you can squeeze overnight camping stuff on one, they can come with 'proper' single paddles and are much easier to hop on and off and swim from - which you will want to do in the summer heat. That said the campsite at Valon Pont D'arc had a handfull of old canadian style canoes amongst their no longer used discards from the fleet that were gathering dust in a corner of the site two years ago. Maybe, just maybe, they might let you use one but they weren't 'good' canoes and I would take the modern hire jobbies in preference every time. I hope you enjoy the paddle there as much as we did. if you can't get a canadian go with the plastic. ( the put in was attached to the campsite) we had a fantastic day - did it in one, although as stated it's easy to take kit and camp over night to make it an easier trip. Watch out for the riverside german nudist colony -not a pretty sight! Paddled the river two years ago in one of the sit-on logs. It was quite a bit to handle on my own, and there crowds spoilt my day. If I were to do it again, I would book a place at the 'bivouac' I believe this is compulsory for an overnight stay. In the morning I would have several large café au crème with croissants in "Les Vans". (Note Avoiding vallon de pont d'arc) before going down to the river at lunch time. By then you hope that the main fleet has flushed away, and you could have the place to your self. After overnighting at the bivvi I'd be up at sparrow fart, and away before the herd arrive. I'm sure that you will find a driver to do the return transport. There were literally dozens of them. The scenery is totally magnificent, and the nudist beach mentioned reminded me of Neanderthal man ! Notice that the paddles blades are fixed parallel. Drove me bonkers! This was quite funny as there were photographers fixed in place taking the snap at €10 a pop ! next to them a permanent St. Johns station clearing up the scrapes and broken limbs. Thanks for the replies everyone, i've actually paddled the gorge twice before so i know what i'm in for, i'm just really trying to avoid doing it in a rent a crash plastic sit on top! And Ray, hope you got my PM, i saw a Mad River explorer on the driveway of a hireplace last year when i was there with you, somewhere between Pont d'arc and Valon? I have a e mail and phone number of a company on the main drag that has a couple of Old Towns for hire. Not here though as I have just grabbed an opportunity to get on line. Next time i will post info. River has been very high. The weir in Vallon was completely covered not even a wave the other day. It is now a bank to bank lethal stopper. River is magnificent. No rock showing on rapid above Pont D Arc. Big standing waves. I will be the area until the end of May and then I move onto Slovina. We camped at a very nice campsite by the bend in the river at Samzon on the road to Ruoms. We were reasonably early in the year and it was uncrowded and the restaurant on site was excellent. Ray your an absolute legend!, eagerly awaiting those contact details!!! edit : how's Black Tooth looking? Last edited by nakedfiremaker; 23rd-April-2008 at 05:30 PM. Water and weather glorious at moment. River is running well and no longer brown. Paddled from Balazuc today (Coach 3 Assessment Kayak). Great place to work. Black tooth will be a piece of cake at this level as the river will be very wide. No rain forcast at the moment so it will continue to drop off. Awesome, cheers Ray you're a legend. Good news about Black Tooth, can't wait. Simone says hi! Just read this and am sitting in my office asking myself why am I here? This time last year I was out there paddling the Ardeche 3 times a week... roll on holiday next month... 2 weeks down there is better than not being there, but not as good as 2 months down there!!! the river was extremely high and paddling was banned for the first couple of days. This was a BIG river, all the rapids were gone and the water was moving at about 10mph. Charlemeign was interesting, it had been replaced by a 100M stretch of 2-4Ft white crested waves. We got swamped in our Old Town Disco, luckily we had 2 beach balls for boyancy as the hire compay didn't have any air bags. A very different river this time round. You couldn't even portage the hairier bits as there was no beach left. The depth marker outside Gornier was almost submerged, you could just see he red tip poking out of the waves. Strong wind in the gorge is also a challenge. I had to get out and tow the boat a couple of times. The worst of the weather was on the first day (of 2) and i just didint get any pictures at all due to the concentration i was having to put in as the boat was moving so fast and it was choppy stretch after choppy stretch with no way of knowing what was around the next corner. River levels were ballistic all over France. All rivers were closed in the Durrance area: paddlers were arrested if caught on the water. 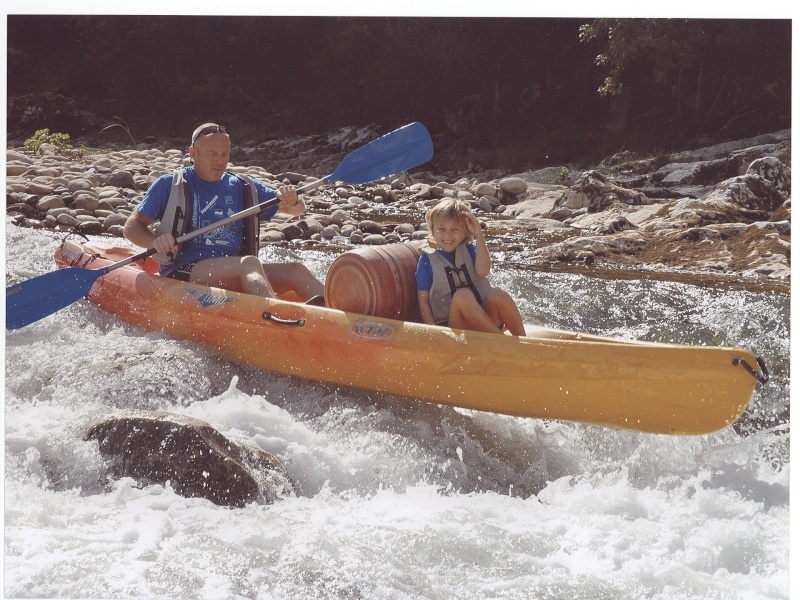 We paddled rivers in the Ardeche are that normally only flow in winter.